Powerful Steam in No Time! The Steam Genie handheld steamer is a fantastic steamer for both travel and home use. I’ve been looking for a great compact garment steamer that can easily be taken with you on trips and I think I found a solid candidate that you should consider. Handheld steamers made specifically for clothes are life savers when you find your freshly washed and dried dress shirt has a few wrinkles. You can quickly and easily steam the wrinkles out without messing around with an iron and ironing board. The quick heat up time of this unit makes it my go to choice for touching up wrinkles. The compact size and power of this steamer makes it ideal for home and travel use. I still cannot believe such a small package can be so powerful! The Steam Genie comes in at 8.7 x 6 x 4 inches in size and just over one pound. While some may buy it specifically for travel, it serves well in the home for quick touch ups when you are in a hurry. The Steam Genie comes with a 900 Watt heating element which means the unit will fully heat up in about a minute. This powerful steam will easily satisfy your needs when it comes to removing wrinkles. You can actually see the water boiling inside the unit after about two minutes. I feel the quality of this garment steamer is top notch and there’s a reason it’s doing so well in sales on Amazon.com. Quickly heats up thanks to a 900 watt heating element. In 1-2 minutes you’ll see steam and boiling water in the tank! Steams out wrinkles quickly and easily. Great for clothes, bedding, tablecloths, linens and more. Gentle on delicate fabrics. Use it on satin, nylon blends, cotton, wool, linen, sequins, beads, embroidery, etc. We have found no real negatives with this steamer in our search for common pain points or quality issues. There’s so few moving pieces to the Steam Genie that there isn’t much to break or parts that become inconvenient. When used as it’s intended to be used, it cannot be beat. Sure, other steamers may have larger tanks or can steam more garments in one fill up, but these will not be as portable, as easy to use, or even as good in build quality. Check out this user video of the Steam Genie in action! I am confident in that you’ll love the Steam Genie handheld steamer for your home and travel. The Steam Genie handheld steamer is a steal at this current price. Arguably the best handheld garment steamer on the market right now. It’s ability to heat up in 1-2 minutes and steam out any wrinkle it it’s way, all while maintaining a compact, lightweight design makes it an easy choice to add to your travel suitcase. PORTABLE & COMPACT - It is portable, powerful, and compact. Carry it with you anywhere, anytime! It is perfect for business trips, vacations, destination weddings, or any other place where you'll need to smooth and de-wrinkle delicate clothing quickly, safely, and gently! HEATS UP QUICKLY - The SteamGenie heats up in less than 2 minutes, allowing you to start steaming fast. Plus, it is extremely easy to use! The large water tank will automatically produce non-stop, ready to use steam that will penetrate any fabric and eliminate even the worst wrinkles, leaving you with a crisp, smooth look. 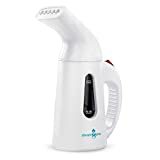 ELIMINATES WRINKLES - The SteamGenie Portable Garment Steamer is the most powerful handheld garment steamer on the market! It smooths and de-wrinkles any garment quickly and easily. You can even use it on upholstery, drapery, bedding, table linens, and more! Never worry about wrinkles again!